Welcome to my Virtual Tea Room. 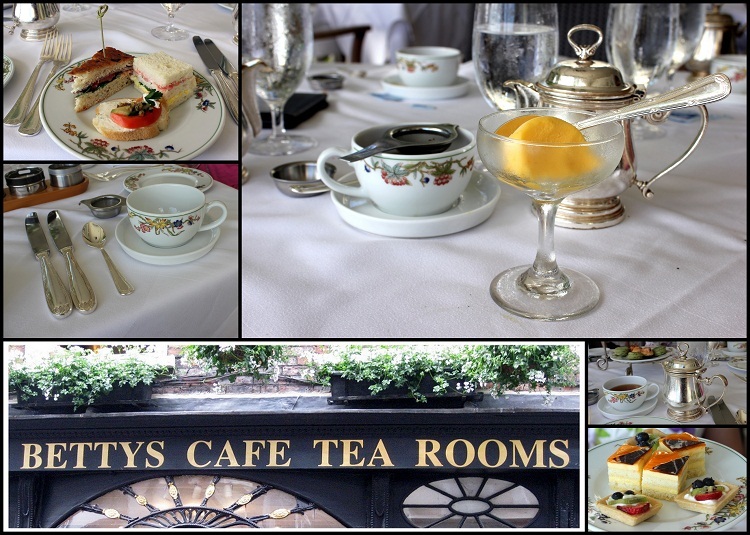 I occasionally visit Tea Rooms, or as in today's post a beautiful hotel. In the center of the Moana Surfrider's courtyard stands a large Banyan tree. The Indian Banyan tree was planted in 1904 by Jared Smith, Director of the Department of Agriculture Experiment Station. When planted, the tree was nearly seven feet tall and about seven years old. It now stands 75 feet high and spans 150 feet across the courtyard. The Moana Hotel, also known as the First Lady of Waikiki is a famous historic hotel on the island of Oahu, Built in the late 19th century as the first hotel in Waikiki, the Moana opened its doors to guests in 1901, becoming the first large hotel in Waikiki. In Hawaiian, moana means "open sea" or "ocean." Hi girls~We are sitting on the veranda. The girls are facing the beautiful ocean and I'm behind the camera running around acting like a crazy woman snapping photos for this post. The girls were so sweet and happy we were having tea at such a beautiful place. 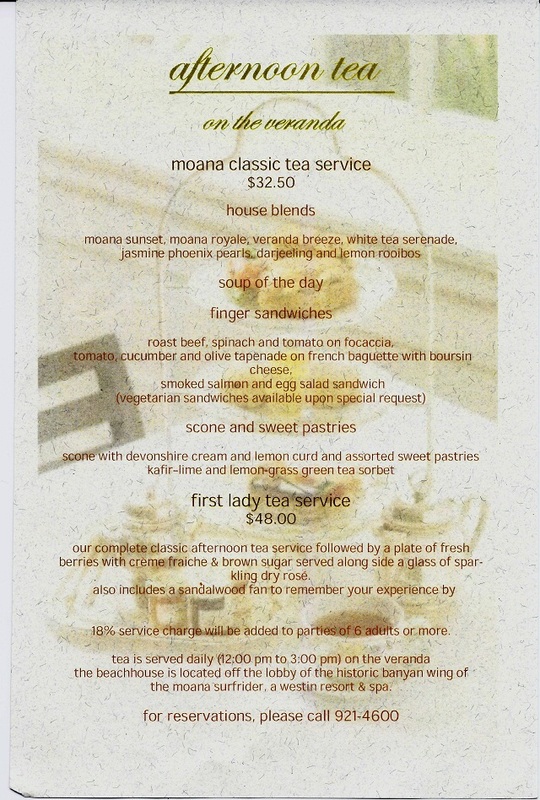 We enjoyed the moana classic tea service. The soup of the day is Pumpkin soup. We sipped the soup from the small cups. The portion was just the perfect size for afternoon tea. I love the crisp white table linens and the heavy hotel dinnerware. The design on the dinnerware is so tropical and an excellent size plate to serve finger sandwiches, scone and sweet pastries. The tomato, cucumber and olive tapenade on french baguette with boursin cheese was fabulous. The smoked salmon and egg salad sandwich was divine... The smoked salmon and egg salad is going to be a favorite go to sandwich for this summer entertaining. The roast beef, spinach and tomato on focaccia was amazing. The Three Tier Plate Stand was a perfect size for our tea table. Scones with devonshire cream and lemon curd. I love the tea pot. I poured three cups of tea from the pot. I want the tea pot. The water, clouds and surfers. What a fantastic sight to see! Do you notice the necklace we are wearing? I bought each one of us a Flip-Flop necklace in remembrance of our wonderful vacation together. Please join me as I hop across blogland to share my Afternoon Tea in Hawaii with my dear friends. Thank you all for your comments while I was away. I Wish I was there! Lovely...everything! Oh, Betty, what a wonderful trip you had! All you girls look beautiful and I can tell that everyone had a fabulous time. The hotel is beautiful and looks like a lot of goodies on the tiered server. Perfection - that is Hawaii - paradise! Thanks for sharing some photos from your trip, Betty. What a splendid time you all had at tea, Betty! The food looks simply fabulous. I want that teapot too! How cute it is! It is a beautiful hotel and the view is spectacular. What a special way to celebrate a birthday! You girls all look lovely and enjoyed yourselves immensely, I can tell! Thank you so much for sharing your trip to paradise with us. I've enjoyed it so very much. Thank you for inviting us to your virtual tea! What an exciting trip for all of you. this looks like so much fun. I want the tea pot, too! Toss in some mango sorbet, too! What beautiful memories all of you made. Happy Tea Day! It looks like a fun day. The tea looked great I love high tea everything is usually so good. I want to go there too! This food is so lovely and that view of the ocean - glad you were able to do this! Thanks for linking to Tea in the Garden. I just LOVE that huge teapot sign, how cool! What a wonderful trip for you girls!!! Loved seeing the tea room and all the food. I want that teapot, too!!!! My family and I love afternoon tea. This is the first time I've seen your blog-- and I'm so glad I've come across it! I'll be sure to read about the other tea rooms you've been to. reminiscing all the way thru this post ! especially when a bride and groom arrived in the courtyard for their Hawaiian wedding ceremony while we shared a front row seat as we 'tea=d' on the verandah ! !